If you are on a short visit and need a quick exit, 1 or 2 nights at our hotel 4 km from Aarhus city centre, located at the Ring Road, is a great choice. We offer a large conference department, and if you arrive by car, there is free and easy parking outside. Enjoy a nice stay at our hotel in Aarhus that features a recently renovated reception, lobby, bar and restaurant area. The hotel has a large meeting and conference department with flexible meeting rooms, modern audio and video equipment as well as room for up to 250 participants. The meeting facilities as well as all the rooms on the 4th and 5th floor have also been upgraded. Our hotel rooms at Scandic Aarhus Vest are designed in a light Nordic style with great views from the highest floors. Outside the hotel, we have 200 parking spaces where you can park for free during your stay. When you feel the hunger pangs after a long day, the obvious thing to do is to visit the hotel restaurant which has been decorated in light colours and has an air of peace and quiet. You should also enjoy a refreshing drink or cocktail in our relaxed bar, and should you have the energy, you can try out one of our many fitness machines or allow yourself to relax in the sauna. You’ll find hotel Scandic Aarhus Vest 10 minutes away from Aarhus city centre. The hotel is easily accessible via the Ring Road and is a good base for the easy and convenient exploration of the many attractions and sights in Aarhus. Take a trip back in time in Aarhus Old Town or Moesgard Museum or see modern art at ARoS, Aarhus’ Art Museum. Aarhus has been named as Denmark’s best shopping centre on a number of occasions and also has a unique restaurant and café environment. Satisfy your appetite in our restaurant with carefully prepared dishes or visit our bar to relax for a while. In the morning, we put a little extra time at the breakfast buffet for you to get a good start to the day. 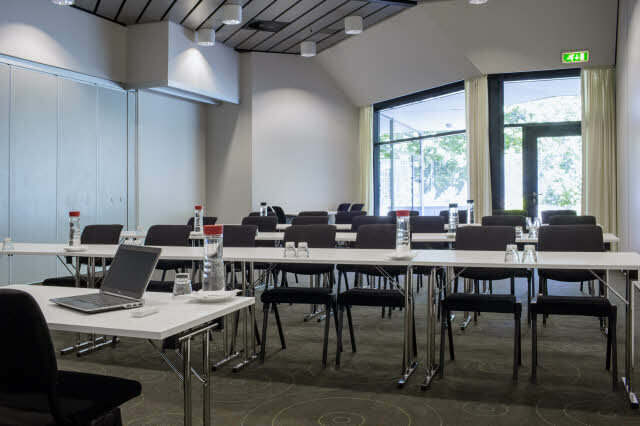 Thanks to the excellent location of hotel Scandic Aarhus Vest nearby central main roads, it's the ideal place to hold conferences in Aarhus. is the number of points you need to book a reward night with us. Read more!